Dunbar and Boardman: Where was the first Travelator Installed? A Moving Walkway or Travelator is a slow moving conveyor mechanism that is used for the horizontal transportation of people over short to medium distances. They can also be installed with a slight incline. The primary benefit of a travelator is that it can greatly decrease passenger travel time in areas where there is a high volume of passenger traffic – airports and train stations being two of the most common locations. The word Trav-O-Lator is a registered brand name belonging to the Otis Elevator Company. You can read more about the Founder of Otis here. When was the first travelator? The late 19th century was a time when the founding fathers of the Vertical Transportation industry were manufacturing and installing ever more sophisticated vertical transportation systems around the world. The first ‘Double Deck Elevator’ was installed in the Eiffel Tower in 1889, for example. This was also the time they turned their focus to moving walkways or travelators. The first moving walkway debut at the World's Columbian Exposition of 1893, in Chicago, Illinois. Passengers could choose to sit on one section or alternatively they could stand or walk in another section. It was installed down the length of a lakefront pier and passengers were horizontally transported to a casino. The next moving walkway was presented to the public in Paris at the Paris Exposition Universelle in 1900. That walkway consisted of three elevated platforms: the first platform was stationary, the second moved at a moderate speed and the third moved at about six miles an hour. Given these very public demonstrations in 1893 and 1900 it is perhaps surprising that the first commercial walkway in the United States was introduced over 50 years later in 1954. The walkway was installed at the Pavonia Terminal inside the Hudson & Manhattan Railroad Erie station in Jersey City, NJ. Named the "Speedwalk" and built by Goodyear, it was 277 ft in length and moved up a 10 percent gradient at a speed of 1.5 mph. 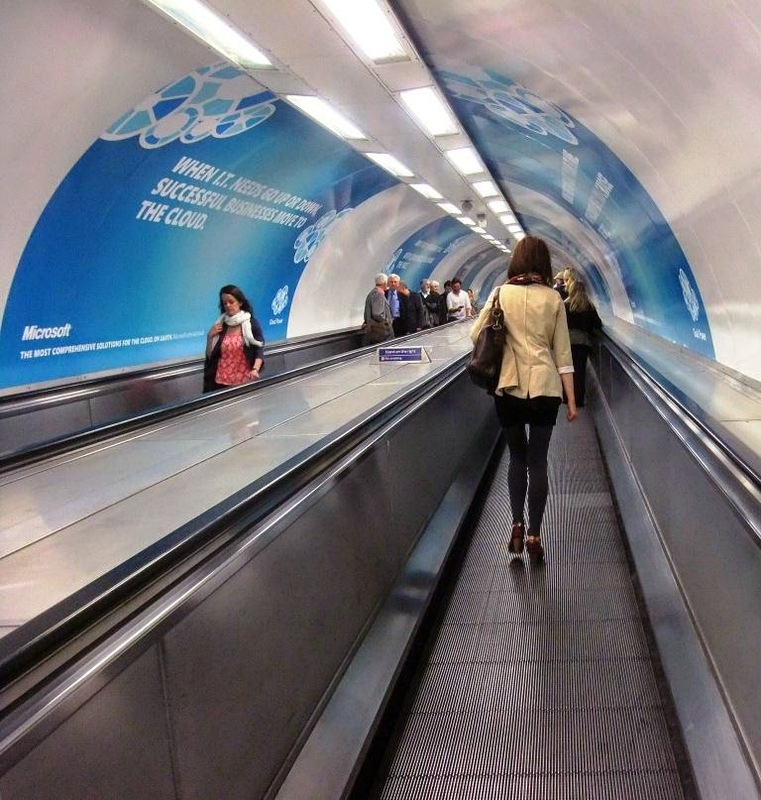 It was 6 years later that the first moving walkway was installed in the London Underground at Bank Station. Bank Station’s Travelator was also the first moving walkway installed anywhere in Europe and was opened with much fanfare on 27th September 1960. Click here to view news footage of the opening ceremony. The system installed was the Otis Trav-O-Lator. Are there any High Speed Travelators? Since the 1960s there have been many projects investigating the practicality of creating high speed travelators. Ultimately the vast majority of these high speed travelators have not been put into public usage or have been abandoned during testing due to safety concerns. However, a high-speed walkway was installed in the Montparnasse—Bienvenüe Métro station in Paris in 2002. During 2009 it was announced that because of its unreliability and the number of users having accidents the high speed walkway would be replaced with a standard moving walkway. This replacement was made in 2011. Where are moving walkways typically used? In addition to airports travelators are often used in the following locations: museum exhibits, zoos, theme parks, theatre, public transport, urban areas, ski resorts, supermarkets. In the UK, The Tower of London uses a moving walkway to horizontally transport visitors passed the cabinets that contain the Crown Jewels to minimize congestion. Dunbar and Boardman is the lift, escalator and access equipment consultancy. Do you have a current or planned project that includes Travelators? We would be happy to discuss any such requirements and how we may be able to assist. Give us a call on T +44 (0) 20 7739 5093 or send us an email via peterboardman@dunbarboardman.com to start the conversation. We look forward to hearing from you.